If you’re looking for a fresh tasting salad to accompany rich holiday dishes, this is a good choice. 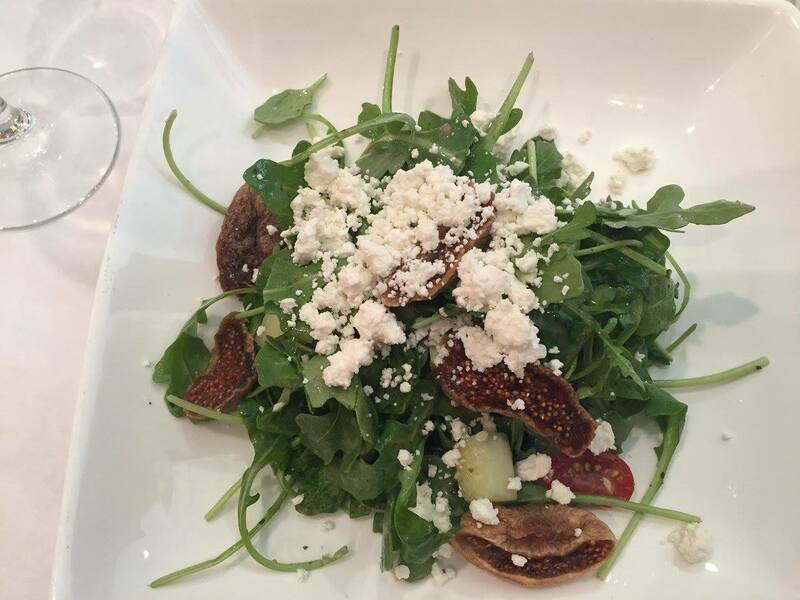 The combination of tangy arugula with the sweetness of figs, cucumber freshness and a lemony dressing blends so well together. It’s a tasty, healthy treat rich in fiber and folates *–and very easy to prepare. Topping with crumbled goat cheese adds additional richness and a creamy mouth feel to finish it off deliciously! 1. Wisk dressing ingredients–let sit for about 1/2 hour to blend–then wisk again just before adding to the salad. 3. Arrange sliced figs/tangerines and cucumber on top of salad. 4. Crumble goat cheese on top and sprinkle with lemon pepper to taste. The spring weather here in Santa Cruz is making me crave salads. One I made recently is this very tasty salad with flavors that remind me of the fresh, delicious, inventive foods we enjoyed on the amazing Vietnam journey we took a few years ago. 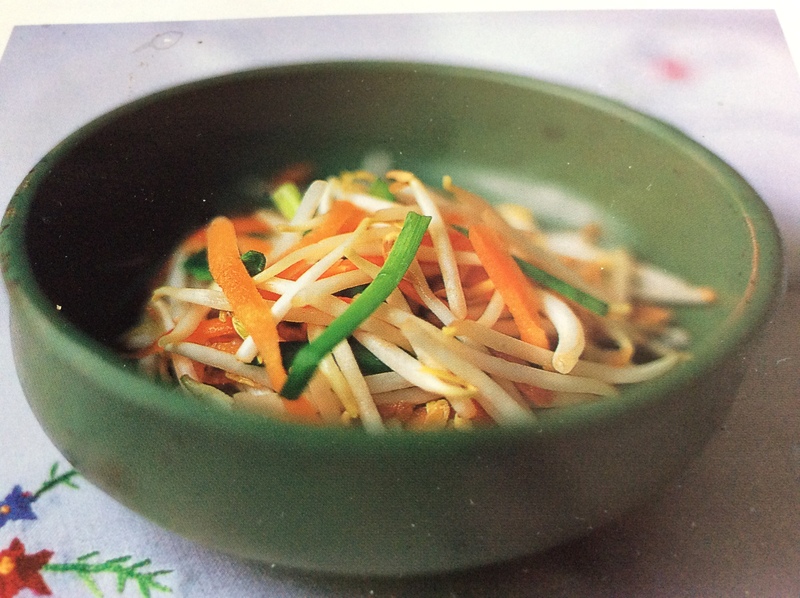 This salad is made with simple ingredients; fresh bean sprouts, green onions and carrots. But it’s the dressing that gives it the sweet, tangy goodness that makes you want to lick your plate! As I’ve used previously, the sweetness comes from Xylotol, a low carb sweetener made from hard wood. It’s easily obtainable at most grocery stores that offer organic foods, such as Whole Foods and New Leaf, a local NorCal chain. Rinse bean sprouts and set aside to dry for approx. 1/2 hr. Combine sprouts, carrots, green onions in salad bowl and refrigerate. In a saucepan, bring the Dressing ingredients to a boil over medium heat, then reduce heat to low and simmer for 2-3 minutes to dissolve the Xylotol. Dress the salad and let marinate for at least 1 hour. Optional: serve with chopped cilantro. In the previous post I told you about the delicious lunch combo and gave the Lemony Kale Salad recipe. Now here’s the 2nd half; the New Tuna Salad recipe. What’s new about it? If you’ve followed Type2delicious for awhile you may remember “Rick’s Chicken Salad,” chock full of carrots and other good things; you can find in previous recipes under “Light and Tasty Lunches.” This time I added hummus to the salad mix, along with a dollop of Mayo, carrots, red onion and spices, and of course, fresh lemon juice. You can serve the tuna salad on a bed of romaine lettuce or a slice of whole grain toast, depending on your dietary needs; of course, the lettuce base is ideal for low carb diets. 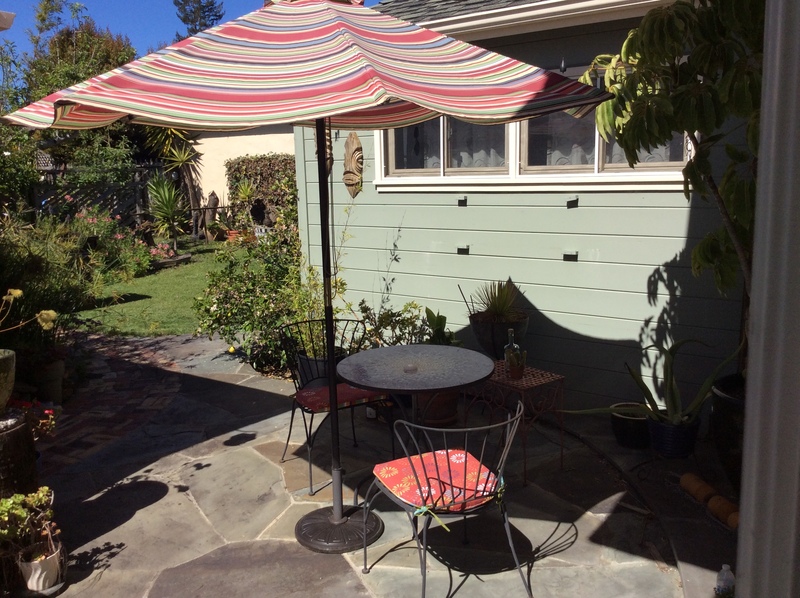 This is a perfect lunch dish to enjoy when the weather cooperates and you can eat al fresco, as we do in our “Cafe Baxter,” named for our cat who likes to rest on the chairs in the CA sun. Baxter on his favorite cafe spot. 1/2-1 celery stalk, chopped fine. 1/3 cup hummus, any flavor; (I tried tomato basil hummus and liked it, also a lemon garlic one was delicious.) You can add a bit more once you mix the dressing with the tuna to get the consistency you like. 1-2 Tbsp. Mayonnaise; Best foods (or Hellman’s) light is my favorite. Combine/mix dressing ingredients; I use a small wisk to mix well. Combine Tuna and veggies in medium size bowl. Combine Tuna salad and dressing, and refrigerate for at least 1/2 hour. We are lucky in CA to have warm days in April that beg for outdoor eating “al fresco.” We take advantage when we can and enjoy these two delicious salads together; crunchy kale with a tangy lemony dressing along with our favorite tuna veggie salad. This time I added hummus to the tuna, along with Mayo, carrots, red onion and spices, and of course, fresh lemon juice. You can serve the tuna salad on a bed of romaine lettuce or a slice of whole grain toast, depending on your dietary needs. First comes the Lemony Kale Salad recipe; the Tuna to come. Stay Tuned! Combine/mix salad dressing ingredients and let sit for 10-15 minutes. Combine kale and sprouts and onion in salad bowl. Brown seeds/ nuts in skillet or bake 350 on cookie sheet for 10 minutes – let cool. Dress salad and sprinkle nuts/seeds on top. After lots of rich food, cocktails and wines over the holiday rush, parties and family celebrations, I welcome a crisp salad using fresh winter ingredients, including the sweet taste of Fuyu persimmons, which are abundant during this season. As you probably know, there are two kinds of this golden orange fruit; the Fuyu, which can be eaten raw, like an apple, and the Hayachi, usually used in cooking, as it must be allowed to ripen until soft and mushy, otherwise it is very astringent. See the link below for an overview of persimmons. For this salad I use the Fuyu and endive, which slightly bitter taste combines well with the sweetness of the persimmon. Add fresh crunchy romaine, some arugula, with a savory, tart dressing based on olive and walnut oil, and you have a salad that is refreshing for a jaded holiday palette and simply delicious. 1. 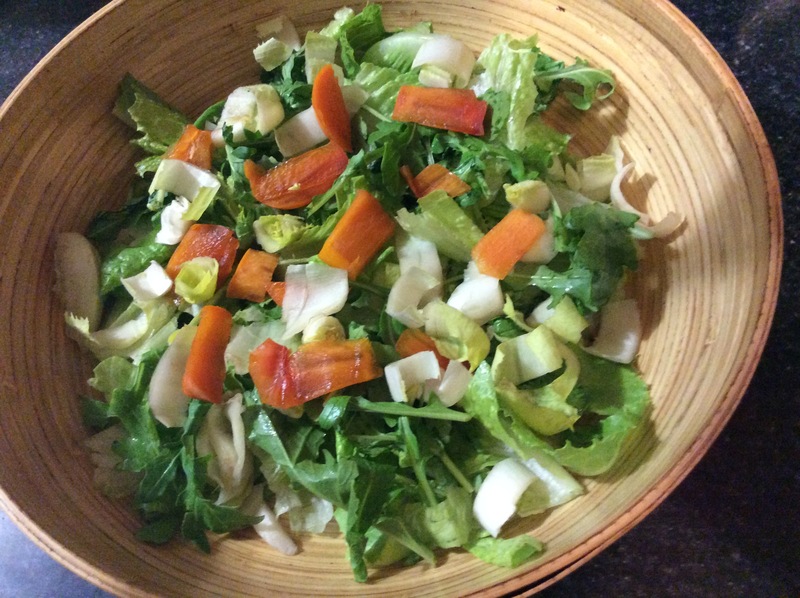 Add romaine and arugula in a large salad bowl. 2. Wisk dressing ingredients in a separate bowl or container. 3. Dress and toss the salad greens before adding other ingredients on top, (a technique so that the toppings stay on top–from Rick’s daughter who worked as a catering assistant). 4. Add sliced endive and persimmons on top of dressed greens. 5. Sprinkle with sliced almonds, Herb de Provence and seasonings. 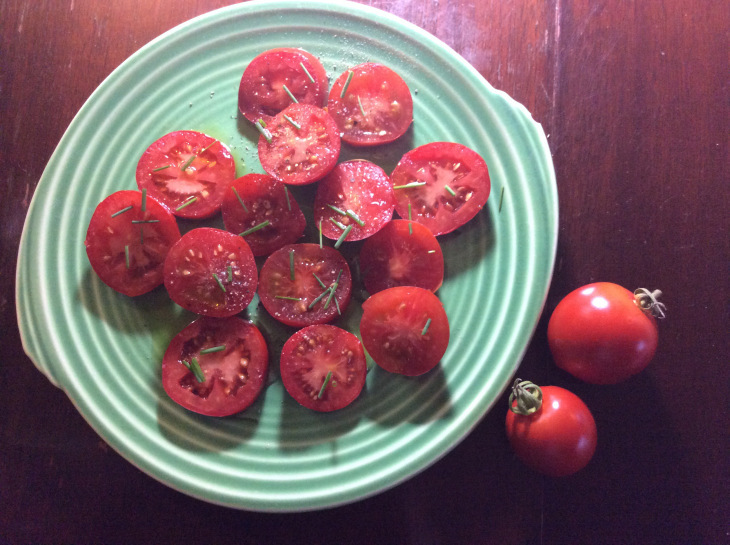 Back to Greece for a Greek Salad update-plus a salad with the first tomatoes from our garden-I wait all year for this–tomatoes from the garden can’t be equalled! And of course, low carb and easy to prepare. With such delicious fresh ingredients simple preparation is the best. That’s it! So simple and delicious! I’ve enjoyed Greek salads for years and thought I knew what they consisted of- a generous bed of iceberg lettuce, tomatoes, red onion, cucumber, green peppers, Kalamata olives, some feta cheese sprinkled on top, with lemon and olive oil dressing. Sounds good (and it is) but what’s wrong with this recipe? Nothing, but it’s not exactly the traditional way. 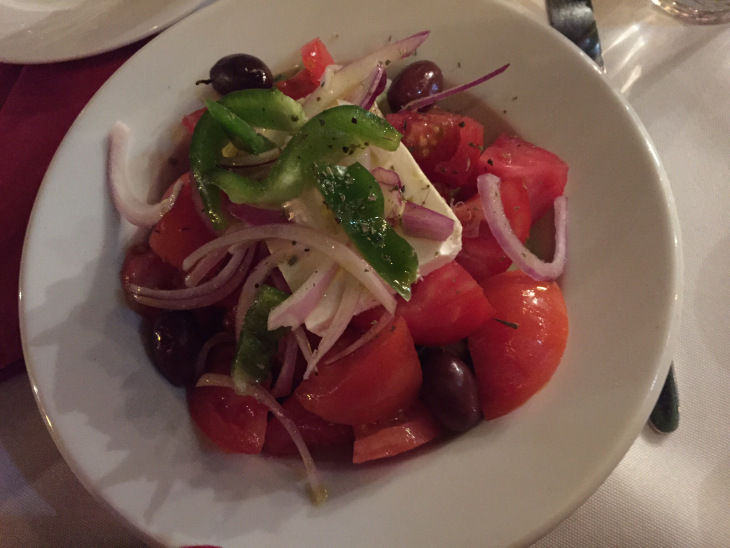 I recently had the good fortune to visit Greece and was even more fortunate to eat traditional Greek salads in lots of tavernas. Guess what? No or very little (a few leaves) of lettuce. Yes, lots of fresh, delicious tomatoes, crisp cucumbers and green peppers, sweet red or white onion and both green and black Kalamata olives with big flat slabs of feta cheese on top, usually sprinkled with dried oregano. No lemon, but good first press Greek olive oil and sometimes red wine vinegar. Fresh, tasty and of course, healthy- no carbs to speak of. 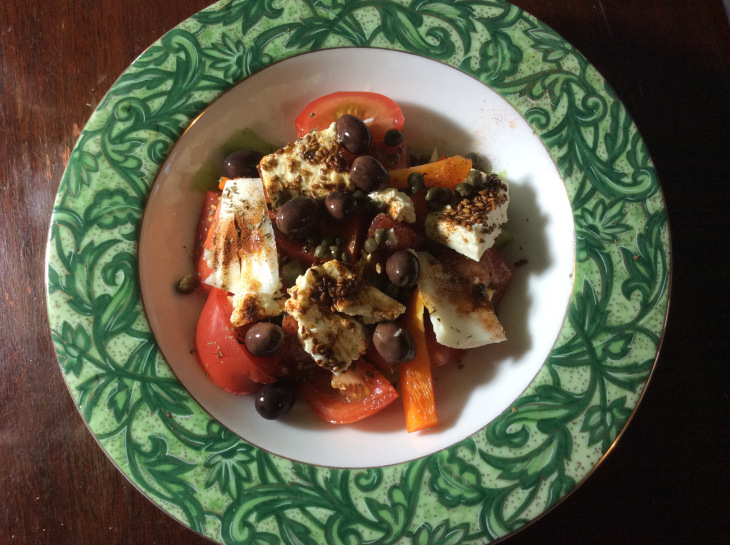 In one (my only) high end restaurant the feta was soaked in olive oil and covered in toasted sesame seeds plus plump capers were added – a delicious variation. This salad is best with fresh tomatoes and the other vegetables from your garden or farmer’s market. And please use only best quality extra virgin Greek olive oil! 1. In a large bowl, put cucumbers on the bottom. 2. Add tomatoes, green pepper, onion. 3. Add olives (and capers if you like). 4. If you like, soak feta in olive oil and roll in toasted sesame seeds. 5. Put feta slab on top; pour olive oil and vinegar over the salad; sprinkle feta with oregano.